Hawaii colleges and universities are leading the way in many exciting new initiatives, from going green to providing extra financial aid incentives to students at risk of dropping out of school. Students who are interested in earning their college degree can benefit greatly from online learning, which enables Hawaii residents on any island to earn the same, top-quality college degrees as students living in the bigger cities on O’ahu. This page covers how much it costs to earn an online degree in Hawaii, how to find the best online program and the tips and tricks to save money on tuition, transfer and jump-start your college career. Online colleges in Hawaii offer a variety of programs that cater to the diverse education needs of students from all the islands, as well as other states. Some students choose Hawaii’s online programs because they prefer the flexibility and affordability, while others want to pursue common careers in the state like biology and ecology or disaster management, or take advantage of concurrent programs for military personnel. 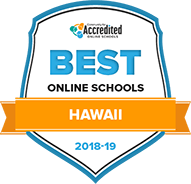 No matter your reason, we’ve ranked the online programs that provide the best mix of quality and student support in Hawaii to help with your search. Chaminade University of Honolulu offers several online undergraduate degrees geared toward adult learners, military students and others needing flexibility. Most courses are in an accelerated, 10-week format, which allows for earlier graduation, and are offered 100% online, or can be combined with evening and weekend classes, depending on a student's needs. These are all 120-credit programs, with varying special requirements required prior to graduation, such as a community services internship for the religious studies program; or Praxis II testing, student teaching credits and licensure preparation for the secondary education program. The University of Hawaii at West Oahu's online bachelor's degree programs are considered transfer programs and are designed for students who have completed lower division courses on campus, or through other schools within the UH system. Students will enter the online programs as juniors and can then complete all upper-division courses completely online, which can take between two and three years. Technology used for online classes include interactive television service, Blackboard Collaborate and Laulina, UH's course management and collaboration system. Degrees are offered in business, public administration, social sciences, early childhood education, political science and psychology fully online. The available online bachelor's degrees at Hawaii Pacific University are 4-year programs, with 36 general education credits; a combination of lower and upper division, degree-specific courses; and a capstone or practicum prior to graduation. Areas of study include psychology, history, diplomacy and military studies, and business, with options for areas of concentration depending on the program. These degrees prepare graduates for entry into major-related career fields while also providing a stepping stone to graduate school. Online students at the University of Hawaii at Manoa can earn bachelor's degrees in nursing after completing AA degrees at designated Hawaiian community colleges, earn bachelor's degrees in economics or design their own online majors through the interdisciplinary studies program. The interdisciplinary program is flexible, requiring 36 major credits based on students' interests and approval by advisors. The school also offers a post-baccalaureate certificate in secondary education; graduate certificates in various education topics; and master's degrees in such subjects as nursing, business, education and counseling, all online. Manoa students have additional options for distance learning through other colleges in the UH system, and through the Western University Exchange. Courses through Manoa are through ITS (interactive Television Service) or Laulima, the UH system's course delivery system. University of Hawaii at Hilo online bachelor's degrees are 120-credit, 2-year programs with required prerequisites that are geared toward psychology students and nursing students with current RN licenses. Psychology students may be able to complete all 45 upper-division courses online, but these courses have limited space, and entry is selective. Prerequisites for both programs, along with other bachelor's degrees, can found online or on campus at affiliated community colleges or other University of Hawaii system colleges. While most courses are fully online and may use video conferencing, face-to-face instruction is required for nursing in the simulation lab, and both majors involve clinical rotations. How can I find which online colleges offer the degree I’m looking for in Hawaii? The Hawaii Department of Education provides a list of all colleges and universities in the state. To find which offer online programs and to understand program availability, check for a campus directory of online classes or distance learning degrees, such as at the University of Hawai’i. Because many military personnel are stationed on the Hawaiian Islands, online programs there often cater to service members who are looking to improve their skills or segue into other careers. Most colleges offer online course options, but it’s important to look into whether those courses also have on-campus requirements. Which online schools in Hawaii will accept my transfer credits or work/life experience? Some schools require you to obtain a set number of credits before transferring in, particularly if your existing credits come from a college outside of Hawaii. Others, like the University of Chaminade, accept all transfer credits as long as they come from a school in the University of Hawaii system. Students who aren’t sure if their credits qualify to transfer from a UH school can use the UH System Course Transfer Database to find out. Additionally, some schools in Hawaii will help students translate life experience into credits through a Prior Learning Assessment. All campuses in the University of Hawaii system have core course requirements, though the details vary between campuses. Students who have met their general education requirements should have no problem transferring credits to another university. Students who already have an associate degree may have an even easier time transferring credits—the University of Hawaii system provides complete information to help transfer students navigate the process. How Much More Do College Grads in Hawaii Make? College degrees usually have a direct impact on earning potential, though the exact impact varies between states. Data from the U.S. Bureau of Labor Statistics shows that more advanced degrees tend to boost salary potential across all careers in Hawaii. The table above demonstrates that jobs requiring a minimum of a bachelor’s degree in Hawaii pay an average of $6,000 more per year than positions that require only an associate-level degree or certificate. Master’s degree holders earn nearly $6,000 more each year than bachelor’s graduates do in jobs that require master’s-level education, and Hawaiians working in positions that require a doctorate degree earn more than $40,000 each year compared to professionals with a master's degree. As online learners increase in numbers, it’s important that the colleges and universities enrolling online students are maintaining quality standards—which is where accreditation comes in. Verification from accrediting bodies around the nation work to make sure colleges are meeting the educational standards necessary to provide students the best education possible. The Senior College and University Commission accreditation, Council for the Accreditation of Educator Preparation (CAEP), Commission on Collegiate Nursing Education (CCNE) and several others are examples of multiple-accreditations held by Hawaii Pacific University. The University of Hawaii Community Colleges are accredited by the WASC Accrediting Commission for Community and Junior Colleges. The Shidler College of Business at the University of Hawaii at Manoa is accredited by the Association to Advance Collegiate Schools of Business. Tuition expenses are a chief concern for many college students in Hawaii—a 2016 study found that tuition for four-year colleges in the state rose 44 percent over a five-year period, outpacing national inflation rates. But there are smart ways to make earning an online college degree in Hawaii more affordable. Tuition Reciprocity Partnerships – The WICHE Student Exchange program allows Hawaii students to earn an online degree at colleges in other western states without having to pay full out-of-state tuition. Combined Degree Programs – Some schools in Hawaii, like Argosy University, allow students to combine their master’s and bachelor’s classes to earn credit towards an advanced degree while completing your undergrad. Accelerated Learning Opportunities – Time savings can translate to money savings—Hawaii students can look for programs designed to be completed in less than four years, like the University of Hawaii at Manoa’s Bachelor of Science in Nursing, which is set up as a three year program. Also, keep in mind that for-profit universities may charge more than nonprofit programs. A 2014 study found that 88 percent of students at for-profit universities took out loans, as compared to 66 percent at non-profit universities. What are Hawaii’s requirements to qualify for in-state university tuition? To qualify for resident tuition, aspiring students must live full-time in Hawaii for at least one calendar year before their first semester at school. This rule applies to adults age 18 or older, but for minors, their parents or guardians must have been full-time residents for a full year prior to the calendar year in which the student wants to attend school. In order to qualify as a resident of Hawaii, no one can claim you as a dependent on their taxes. Some schools may allow a student to qualify for resident tuition if they have demonstrated intent to live and work in Hawaii either indefinitely or for a previously agreed upon period of time following graduation. Are online credits more affordable in Hawaii than other places? Online programs are cheaper than their brick and mortar counterparts in many cases, because students do not have to worry about traditional room and board related expenses. But it is important to get clear tuition breakdowns before committing to an online program. To do this, look for schools ranked by affordability first, and then see which ones also meet your educational standards. How can I get help paying for online college in Alabama? The first step in seeking financial aid is filing a Free Application for Federal Student Aid (FAFSA) to see which opportunities are available and within your reach. Aside from federal aid, there are some Hawaii-specific grants and scholarships available. The Fukunaga Scholarship Foundation: The Fukunaga Foundation offers scholarships to Hawaii residents pursuing degrees in business fields, such as business administration, at any accredited four-year college or university. As long as students maintain eligibility, they will receive $4,000 per year, for a total of $16,000. Hawaii Community Foundation Grants & Scholarships: The Hawaii Community Foundation Scholarship program draws scholarships and grants from more than 170 different funds. Each scholarship fund has its own unique eligibility criteria. Most scholarships require students be a resident and enroll as an undergraduate or graduate student in an accredited two- or four-year college or university. Students are also expected to attend school full-time and maintain a minimum GPA of 2.7. The Hawaii Education Association Student Teacher Scholarship: The HEA offers two $3,000 scholarships to its members, as well as children and grandchildren of HEA members. Applicants must be in good standing and maintain HEA membership for at least one year. The goal of this scholarship is to minimize the need for students to seek employment during the student-teaching semester. To win the scholarships, student teachers must be enrolled in a full-time undergraduate or graduate program at a regionally or nationally accredited institution. Often times, non-traditional learners need extra preparation, both academically and technically, before they start their college career. This is where Hawaii’s adult education programs can be helpful. The U.S. Department of Education tracks how adults benefit from adult education in terms of measurable skills gains—in Hawaii specifically, nearly 30 percent or more of participants see these measurable gains. Basic Education and High School Equivalency Programs – Adult education programs provide learning programs to help adults prepare for college, from GED and Competency-based Diploma programs to basic math, reading and writing courses and English language and literacy classes. College & Career Preparation – Though many programs are designed to assist high-school level students, adult learners can specifically take advantage of the My Future Hawaii web portal that helps students of all ages plan for college and career success. Continuing Education & Professional Development – Bridging the gap some college degrees leave in terms of niche skill development and specialized certifications, check for local Continuing Education programs often offered at Hawaii’s community colleges.